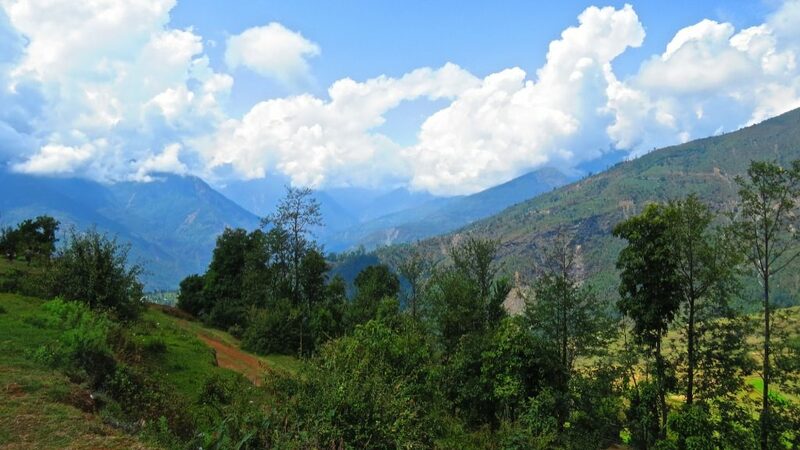 Nitish Upadhyaya, one of our trustees recently visited Nepal and tells us his story. Here he tells of his return to the Helambu Valley. If you haven’t read it yet, catch up on Part 1 and Part 2. 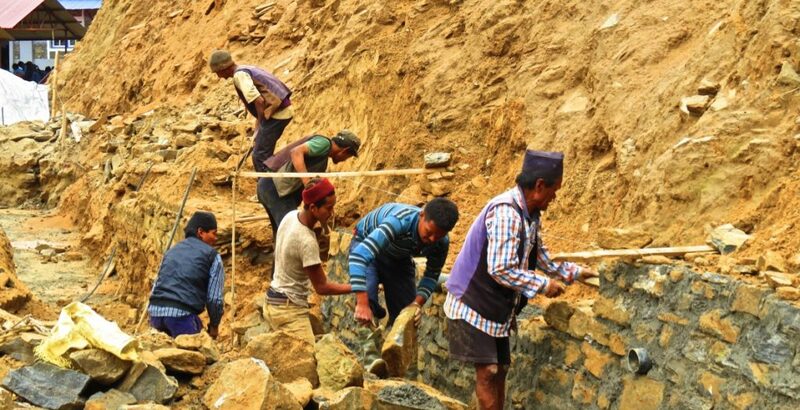 As news of the first earthquake trickled through on 25 April 2015, I had waited with growing dread to hear the fate of my friends and that of the villages which I had fallen in love with. Just over a year on, I set off to see first hand the devastation wrought by the earthquake and the work being done by the HELP team to help the local community return to a sense of normality. Having jumped on the familiar 5.30am bus to Melamchi (the gateway to the Helambu valley), I watch as the landscape changed from urban sprawl to hills and forests. A heavily tilting house, multiple piles of rubble, great gashes across the hills from landslides – all reminders of the impact of the quakes. When I’m not entranced by the outside view, the throng of farmers, produce, equipment inside the bus, along with some particularly playful baby goats, keeps me more than occupied. The next stage of the journey, through the steep tracks and narrow trails by motorbike, leaves me craving the rickety suspension of the bus and the pot-holed roads which had brought me towards Helambu. Suku, my driver and guide, boasts that he has a dancing motorbike. Oh, how we danced through mud, rocks, pools and streams! Two hours from Melamchi, I get my first reward, a visit to a newly completed set of classrooms and a toilet block at the primary school in Birkharka village. 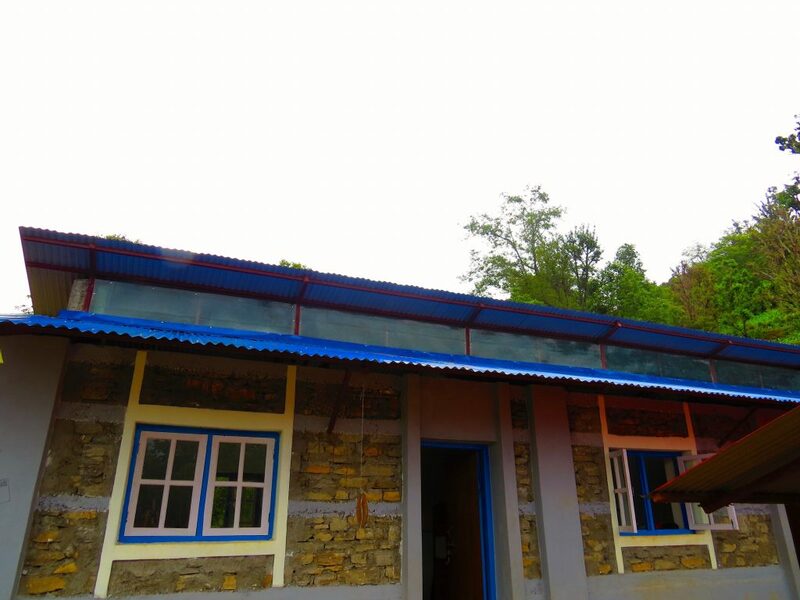 Built to an earthquake resilient specification, I am delighted to see the classrooms in full use. The use of a roof monitor (a skylight) gives the classroom a bright and airy feel – perfect for learning! With more classrooms being constructed, this school is well on the way to recovery. Next up is more bumpy track, this time across to a secondary school in Bhotenamlang village. We’re hoping to build a number of classrooms here but are awaiting funds – at the moment, students are using temporary facilities and it is not unusual to see 70 or 80 students squeezed into the same classroom. From speaking to the teachers, their need is clear. Very hopeful we will be able to raise enough funds to commence construction immediately after the cessation of the monsoon rains. Braving the bike again, we head to Gunsa, a lower secondary school that has hosted many volunteers over the years. The damage to the previous school buildings is plain to see and I can’t quite contain my excitement as I explore the new buildings which are shooting up fast. As I watch a class being taught in the Temporary Learning Centres, I’m proud of how quickly we established these structures in the wake of the earthquakes to ensure that students, whatever their home situation, did not miss out on their education. Over 200 such temporary classrooms were built and resourced, with many still in use while we push to complete construction of permanent facilities. Before we leave, I am inspired by two Nepali teachers, Sagar and Bibek, who have been placed at the school by the Teach for Nepal programme. Similar to the UK’s Teach First scheme, this project takes bright youngsters who have good English skills and places them in schools which have the most need. We talk about interactive teaching methods, something that HELP is working hard to promote by running training sessions for government teachers. We also record some messages from the students to previous volunteers, very much a testament to the huge impact our volunteers have on the local communities in which they live and work. As I head back to Bhotenamlang to stay with Suku and his family, I’m again struck by the awe inspiring beauty of the valley and the hospitality of its inhabitants – we manage to make it home just before dark, but not before being flagged down on multiple occasions to be offered chai and snacks.